‘River’ is one of those things that on the one hand you might be thinking ‘well that’s a pleasant enough, well written, well played sort of track, in a sort of AOR-ish sort of way’ but on the other, and you need to take more than a superficial listen – well I did anyway – you find yourself thinking ‘bloody hell there’s a lot going on in that track, that’s a bit of a slowburner’ and by the third listen you’re quietly grooving along to it’s slow groove. So what’s to like about ‘River’? Actually there is a lot. The thing, strangely, that first got me listening that bit closer is the bass. The bass line on this is languid, it just quietly sets up up a foundation. The next thing is the vocals. I actually have quite a thing about those understated sort of vaguely prog rock, sort of country rock vocals. And this track has that. And I love the guitar on this, it just does something simple really well. And where it does break out, it doesn’t freak out, it doesn’t get hugely loud, there’s just a repeating guitar motif. And the big thing that this track has is that actually it’s simple, there’s no over-complicated instrumentation, there’s not huge amounts of layered sounds. It’s just the adding together of simple lines into something that’s more than the sum of it’s parts. By the fourth listen I started to search for influences, for things that I could say well it sounds a little like. But the list just so large it got very silly. The vocals and the vocal melody is a little Crosby, Stills and Nash, some of the instrumentation reminds me of those sort of melodic prog bands – say Camel, and there are hints of 80s rock – for some reason there’s a nagging thing in my head that keeps saying It Bites, may be way off there if I’m honest. But what I really like when it comes down to it, is that it doesn’t get loud, it just just sort of hovers around quietly understated. But it doesn’t need to be hugely dynamic, do the quiet, loud, quiet, loud thing to be effective. Actually it’s more than just effective, you find this thing getting under your skin, it just feels calm and soothing. I could be accused of always championing bands and artists that take stuff from all sorts of places and cooking up their own sounds – to steal a phrase here from a Facebook Page I follow ‘non-genre specific’ music – and I do like that sort of music a lot. But sometimes what you need is something that, while it doesn’t break new musical ground, is just good well written, well played music. ‘River’ is being added to that playlist. Look ‘River’ is just lovely, it creeps up on you, it slowburns its way into your head. You just need to give it a chance to do that. 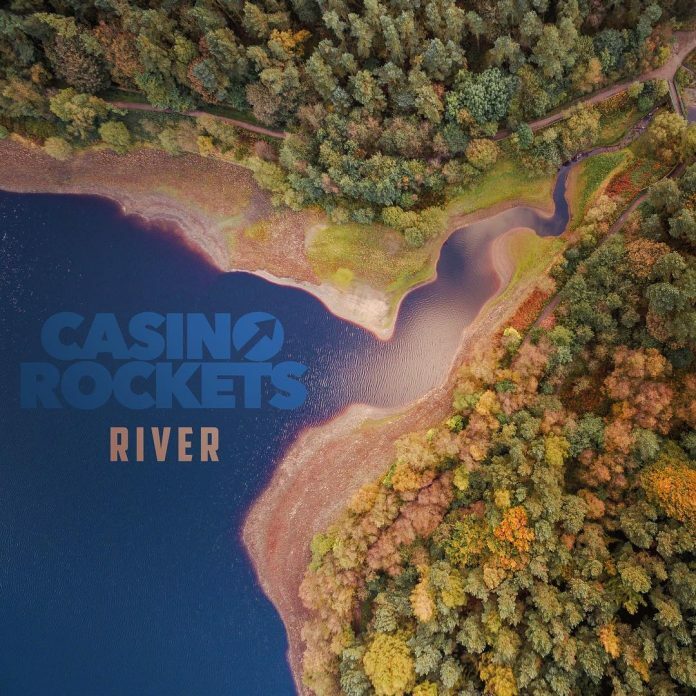 Casino Rockets are an electro rock band from Halifax, West Yorkshire. The band have released 2 singles so far ‘Black & Red’ and ‘Fired Up’ which can be found on all major streaming and download services. 21st September they play Zombie Shack in Manchester.